To 25 more years of producing the industry’s best! The Defense & Sporting Arms Show celebrates its 25 years of bringing the best in the firearms industry to the public. 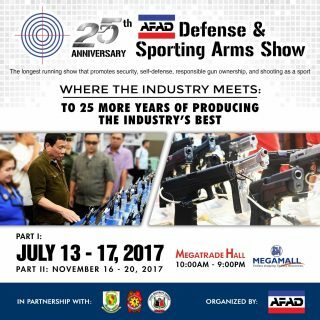 DARC is proud to be one of the exhibitors at the upcoming show organized by the Association of Firearms & Ammunition Dealers of the Philippines. Visit us to avail of exclusive DSAS discounts on all of our products from FNH USA, Kel Tec, Stoeger, Fobus, Technaclip, ETS, Mesa Tactical, Automatic Holster, Man-Pack, Magpul, etc.! The DSAS will be held at the SM Megatrade Hall, SM Megamall on July 13 to 17, 2017.